Responding to God's challenge to get out of the boat and start walking on water! I was reading this yesterday, just before a friend told me she was packing up and heading off to different climes. Her children had all grown up. She has quit her job. All the things that come with the job, all the benefits, the retirement package – just right now she is cutting them loose. I never quite has the courage to do that. That’s actually not true. I did quit my job for a while. I joined a gospel outreach mission for a year. Was it the best year of my life? No. It was a good year, a year to celebrate an adventure in faith. Other years, that came after were as good. I don’t want to forget the former things – not those good things. I don’t want to be always hankering for the good old days as if today can never measure up. I also read these words from Malachi. The people of God had been in exile and returned to Jerusalem to rebuild the city and the temple. They were getting disheartened. They felt that whatever they built would never measure up to the temple that Solomon built. Worship would never reach the lofty heights of a holy smoke filled room, the building shaking and the people falling to their knees in awe. That was all in the past. Things were different now and they simply had to adjust to something “less than” what went before. I’m not sure that God said then that it would all work out right in the end. He gave them a stern talking to. Their attitude was less than positive and their actions were half hearted at best, down right contemptuous at worse. These were the people that Isaiah was speaking to, long before they went into exile. He told them they would go, but it wouldn’t be forever because God had a plan. They had lost sight of the plan God had. The old things held their attention – the good old days that weren’t so good at all. New things? I admit that I’m not always the adventurous kind. My friend choosing to down tools, to waiver pension payments and all the world says will bring security – her actions have made me thing that the comfortable nest I have built is perhaps falling short of what God intended for me. I have downed tools. I retired and got myself a bus pass. So much time now. So much time to do the things God has set aside for me to do. I’m not supposed to keep on building the nest. An old wineskin doesn’t become a new one – not ever. Old is old. The leather is less malleable. There are cracks. It needs to be replaced. God reminded me that I’m not an old wineskin. I stopped being one when I entered into a covenant with Him. What was old was done with. Tossed away as not needed. “How a man conducts himself through success and triumph tells us what is in him.” So wrote H E Govan, a scholar and author from the last century. The context is a battle between kings with Abram’s nephew, Lot, caught in the crossfire. Abram assembled a posse and pursued the army that had taken Lot. He wins back everyone and everything taken and more. The King of Salem, Melchizedek, shared bread and wine with him, accepted a tenth of the plunder and gave Abram a blessing. The King of Sodom wanted his people back but was happy for Abram to take the plunder. It seems to me that sometimes we are of the opposite mind. We are not content to take nothing. We want the thread or the shoestring and what they are attached to. We are perhaps too little concerned about who gets the credit for our flourishing in this world. Just as success and triumph tells us a lot about what is in people, I think failure and defeat also tell us a lot too. I have not been on the success and triumph side of things lately. A reading plan that I am following tells me not assume it’s all an attack from the devil. A few weeks ago, I had a tyre blow out. There was a roundabout turn, a lurching to the left and a loud unpleasant noise. I pulled in to a carpark – the Beefeater on the road out to Loch Ness from Inverness. They, Beefeaters, were still serving breakfast, so leaving me to deal with the car rescue company, my husband sat down to read a paper and eat a full fry up. The rescue man arrived. I am probably in the minority when it comes to knowing how to change a tyre. Had I known, I wouldn’t have been able to anyway. Some part of the wheel had welded to some part of the axel and a few slams with a hammer were required to dislodge the wheel – a few slams – bag slams. I didn’t have a hammer. Anyone coming at me with a hammer and slamming it against me – that’s definitely an attack. The rescue man slamming his hammer against the wheel of my car – that’s not an attack at all. The man is rescuing me, nit attacking me. Not everything that looks like an attack is an attack. The failure and defeat days do not come as a surprise to God. He is not the cause of the failure or defeat. He didn’t make them happen but He permits them because they serve a greater purpose – that revealing “what is in him” – whether it’s to the person themselves or to the watching audience. With the failure and defeat days there is also an equipping. These things don’t always come out of the blue to a person not prepared. We get to test the equipping and discover that God is more than enough. There is always the opportunity to sit down, to weep and wail, and get battered – but that is not God’s preferred option. He loves it when we raise to our full height, stare the disaster in the face and wield the weapons we have been given. Let me tell you about my weapon of choice – the one that I am wielding right now. Poetry! It’s not other people’s poetry, but the ones I am writing now. It’s Lent. I am almost half way through my poem a day Lent challenge. You would think that all the poets, myself included, have harvested every Lent-prompted poem going by now. I am following a Lent devotional that promised me an honest and realistic recognition of where I am in relation to where I should be. My life isn’t pretty and there’s no spiritual cosmetic surgery to make it so. I must deal with what is, not with what I would like it to be. The failure and defeat days happen – but I’m still mid-story. The end has yet to be revealed. So, that’s what my poetry has been about. And God? Where is He? Nowhere? 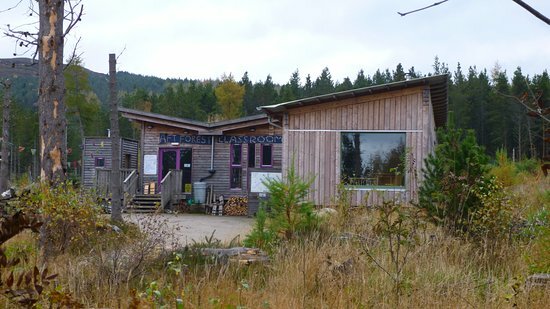 It’s not the first time I have been to Abriachan Forest and written poetry in the forest classroom. It’s not the first time either that I have driven up the steep hill with its winding road, single track and passing places. It’s not the first time I missed the turning and had to turn around. I was the first time that I have taken a travel sick friend with me and pulled over into farm gateways for fresh air stops every so often. The warm and waterproof clothing was not required. It was wet and windy and no one suggested a walk around the place for inspiration. We had all we needed with poems to oil the creative wheels, a warm stove blasting out heat, a pot of tea and a tin of biscuits. The workshop – the Jessie Kesson Workshop began at 2.00. It was lead, not by Jessie, but someone who had won an award and is poet in residence at Moniack Mhor Writing Centre just outside of Inverness. Extracts from “The Wild Bird Passes” provided our first task – picking phases from her work and weaving them into our own prose or poetry. I reach the dark heart of the forest. Trees crowd together, shoulder to shoulder, blocking out light. The air tastes dry and musty. Ancient trees, not willing to bow, loom high. There’s little colour, no bright green of moss, no red flash of wild flower. Brown parades a thousand shades. And silence – no bird song erupts in the quiet, only the low moan and slow creak of trees as the air stirs. Unseen eyes watch and a vague sense of threat strokes my skin. There’s a second verse which I like less and will work on, maybe. In it another wood pile dreams of a fire and flames and a stove. I’m not sure it’s needed or adds anything to the poem. The thing about poetry is that you can give a voice to things that don’t have one. Our third prompt was from Sorely MacLean’s poem “Hallaig”. There is something that I find stirring about Gaelic – both written and read. There was no one to read the Gaelic version. Yet again I’m not sure I understood what was going on. There were lots of place names, and people names with too many consonants and not enough vowels but we stumbled through them. Writing from the viewpoint of tree was a challenge. What do trees see? What changes do they live through? What commentary might they make of the short life span of fleeting forms? I’m not posting my poem. Polished up a bit, it might be submitted to a competition. I loved the work of some of the other writers there. My friend, my travel sick companion, wrote a lovely poem. The tree, standing tall, was thinking about the seeds it had sent out, whether it had sired a forest or not. It was a good couple of hours, not too many people to make you feel threatened, not too few to make you wonder why no one else was there. It was a comfortable environment to share and everyone was very encouraging. There was talk of setting up a regular creative writing group at Abriachan. Count me out. Much as I love poetry, I don’t love winding uphill roads, single track with passing places. The homeward journey was easier to navigate but we stopped often to settle unsettled stomachs along the way. I’m not sure if the unsettled stomachs are indicative of bad driving, bad roads or bad digestive systems – or a combination of all three. Keeping up a conversations didn’t seem to help. Yesterday afternoon I found myself poking around a pebble beach lifting up stones looking for crabs. It was the last of the winter walks organised by the Sottish Waterways Trust. A day or two before yesterday we would have been peeling down to T-shirts and slathering on the suntan oil. The temperature dropped. Gloves and hats were out in force. It was a foggy day. Everything was still. Everything was silent. We walked along to Carnac Point. The last time we had been that way there were bulldozers digging up stuff and workers laying down a proper path. They had done their work and we stopped here and there to admire the picnic tables engraved with poetry, observations and pictures of birds. One of the tables was dedicated to St Kessog. None of us, not even the retired Religious Education teacher among us, knew anything about the saint. The water was so still and the Kessock Bridge so perfectly reflected that it looked like lorries and cars were travelling upside down along with the usual right side up ones. We had been told by the lads from the Scottish Waterways Trust to look out for otters. We settled for crab hunting instead. I wasn’t too enthusiastic about turning over stones. The ones in my garden tend to hide a variety of beetles and wood lice – things that run towards me at great speed. Earlier in the day I had been leafing through an old copy of Country Living. The car was having its front tyres replaced and the magazine was on the coffee table in the waiting room. I was sipping my way through a hot chocolate from the vending machine. I wasn’t interested in buying a country cottage, or replacing the décor and furnishings. The recipes featured asparagus in various dishes. An article “The Lost Words” caught my attention. Later that day, had I not lost my words I could have named the particular brand of crabs that scuttled sideways beneath the stones. I could have identified the trees that marked the path. I could have told you which birds were wheeling above. I’d already been told on a previous visit all about the seaweed. The article was about the way nature vocabulary is diminishing. Apparently in some test, run by some scientists, young children could identify just about every Pokemon character ever thought up. They couldn’t tell you what a bluebell looked like or point out an oak tree. They were nature illiterate! I remember years ago I did a teaching practice in a primary school in a small village in the Northumberland outback. Mine was the first drop off point for the bus. I was there long before most people. I spent the hour or so in the kitchen with the school cooks. Along the windowsill there might have been pots of herbs or a host of wooden spoons pretending to be flowers in a vase. What was there for certain were a number of pairs of binoculars. In between peeling stuff, chopping up stuff or stirring stuff, one or the other of the cooks would stop by the window, pick up the binoculars and search the perimeter of the playground – a green hedge of bushes and trees. They were looking for birds and would call me over and point out anything interesting wildlife. I remember they were not teachers. One could imagine teachers doing that – but kitchen staff? I was nature illiterate then and I am not fluent yet. Robert Macfarlane, an author and poet, and Jackie Morris, an artist, got together to produce a book about nature. The poems are not called poems, but spells – a reminder that the best poetry is spoken out loud and transforms the hearer in some way. The article contained examples of pages from the book – the poem, or spell, and an illustration. The poetry reminded me of Kenneth Steven’s work. I prefer his poems on nature. If poetry is all about the sounds of the words, then The Lost Words uses them well. If you need to see onomatopoeia at its best then this is these poems excel! Perhaps, had I not read the article, I would have talked my way out of joining the lads from the Scottish Waterways Trust on their short walk. I would for sure not have ventured down to the pebble beach. The last time I had been down there examining seaweed, I had slipped on the wet stuff and plunged face down into another seaweed pile. We had been looking at sea lice. Urg! It seems to me that now is the time to start looking at nature much more closely than we do. Some of these things may not be around in a decade or two. When I get to heaven God just might ask me for my opinion about Carcinus maenas and copepods. It’s best to start genning up now. Four foot and eleven and a half inches high on a good day. Weight variable!